We are in the middle of a crazy gun buying spree. All of our distributors are completely out of all semi-automatic rifles, even the 22s. Most of Glock inventories are completely gone. As of this writing, there are ZERO Glocks available at the three largest distributors in the country. I have watched in horror as one of them went through 1800 Korean AK-47 magazines in a single night. Yes, a NIGHT. All of this is of course inspired by the rumors of the impending Assault Weapons Ban. The ban itself is a separate and interesting topic that I want to explore in much greater details, and so I was researching the materials on it. Senator Feinstein's own web site has an excellent collection of academic studies on the effectiveness of the ban. Ironically, all of these studies agree that the previous AWB had no statistically significant impact on crime, and at most just affect the number of "assault" weapons used, but not the incidence (or outcome) of violence. Two of them has a chapter on firearms market dynamics around the time of the ban. Here are a couple of interesting graphs from one. Note: "assault" pistol is a semi-automatic mini-machinegun. Most of the APs referenced in the study are no longer made - not because they were banned, but because they are clumsy, ineffective, and impractical. In modern terms, a Draco would be classified an "assault pistol". As you can see there was a temporary spike in the prices around the date the ban went into effect, but very soon them went down to pre-ban levels. The reason for this was that leading to the ban there was a spike in manufacturing capacity leading to massive oversupply of both the weapons and the magazines. "Responding to the speculative price growth, AW manufacturers boosted their production of AWs in 1994. 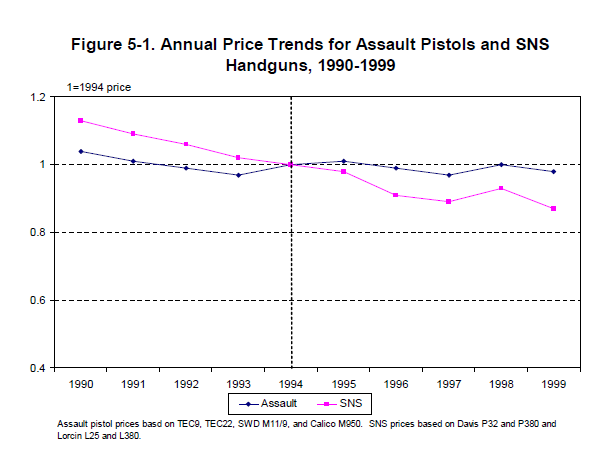 Although total handgun and rifle production were increasing during the early 1990s, the rise in AW production was steeper, and there was a production peak unique to AWs in 1994 (production of other handguns peaked in 1993). It seems that this boost in the supply of grandfathered AWs was sufficient to satisfy speculative demand, thereby restoring national average AP prices to pre-ban levels within a year of the ban and doing the same for AR prices by 1996. 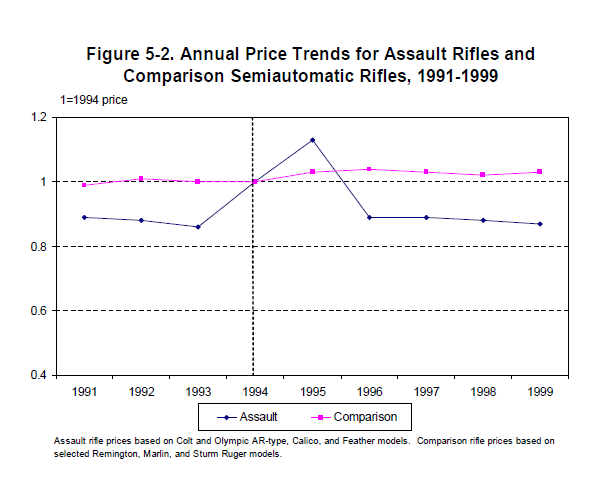 AW prices remained stable through the late 1990s, and production of legalized AW-type weapons dropped off substantially, at least through 1998. This suggests that the supply of grandfathered AWs was sufficient to meet demand through the late 1990s." Here is a way to think about it: let's say right before the ban everyone invest their life savings in guns and magazines in hopes that when the ban will come into effect, they will sell them to other people. The ban does begin, but EVERYONE has excess goods, so there is no one to sell them to. The problem is aggravated by the fact that a lot of hoarders are gun dealers themselves. Most of them operate on credit, not on their own capital. I have heard reports of walls and walls and walls of Glocks at local dealers. Whether the legal climate changes or not, they have to pay interests on these hundreds of thousands of dollars in Glocks, and selling them will be hard because at this point everyone who wanted a Glock already has one. This will affect the entire industry upstream. Oversupplied consumers won't be buying from the dealers. Oversupplied dealers will not be buying from distributors. Distributors are going to choke on the inflow coming from the manufacturers, because there is no outflow. Morale of the story - a few months from now expect some juicy sales :-). And - don't hoard, least the saying "fool and their money are soon parted" be about you. A lot of current hoarding activities does not make sense even ignoring the arguments above. Even if - and this is a huge "if" - another assault weapons ban is enacted, there is absolutely no way anyone could restrict ammunition supply, because it is just too easy to reload. The current prices of $800/1000 of low quality ammunition will buy you a very nice Dillon progressive press which will let you load thousands of rounds in the comfort of your own home, and never - ever - worry about ammo shortages again.